I know, you're wondering what my first copy of Seventeen has to do with Demeter. Well, that was how I first came to learn of the brand and instantly thought that it seemed all kinds of awesome. A brand that, at that time, wasn't entirely accessible in Canada, at least not in my small town. 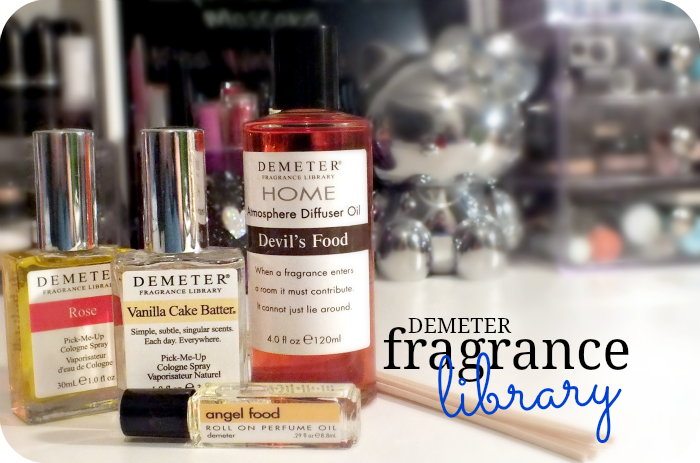 I kept Demeter stowed away in my archives, and years later actually got my hands on a few different scents. Victory pt.2! Today I've got a few more scents to explore. Care to read on? I'd have added the description of Rose from the Demeter site right here, but you know what? I can't seem to find it. I can find Bulgarian Rose and Rose 100% Natural, but neither of those are the product I've got. Oh well. 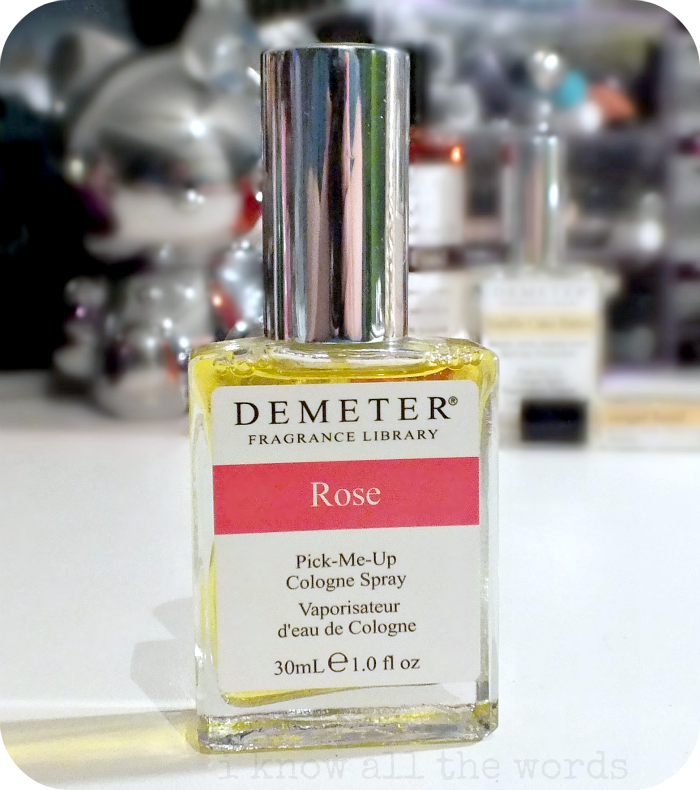 Demeter's Rose is the antithesis of the Demeter motto 'Simple, subtle, singular scents.' Rose is just that rose. When you sniff this right from the bottle, and after initial spritz, comes across as quite strong, but once it begins to dry down, it softens and becomes a really lovely scent. I've never been a huge fan of rose scented products, but I've found that more that I come across them/ use them, the more I find myself liking it. This scent is a definite must have for anyone who loves roses. While I don't agree that licking vanilla cake batter is all that yummy (the flour and leavening ingredients give it an acrid taste that is highly unappealing) but I can get behind the idea of the scent. There is something about the combination of butter, sugar, and vanilla that is just so perfect. This scent embodies that scent so well! You get an added creaminess that is almost custardy (possibly coming from the eggs in the batter?) and the warm sweetness of sugar and vanilla mixed to perfection. I love foodie scents, so this scent is perfection to me, but even for a dessert themed scent this isn't cloying or too sweet. When I first got these items, it was the Devil's Food that I had to smell first. I wasn't sold that they could recreate the complex scent. I was wrong. So wrong. This oil has the most realistic scent. It smells like you just baked a batch of devil's food cakes. It's rich and intensely cocoa based without out being too sweet. I decanted my bottle into a little glass vase and popped in the reeds. It took a day or two for the oil to seep into them, but once it did, the room (my living room) began to smell, well, quite amazing! It isn't overpowering, but you get little whiffs of it every now and then. 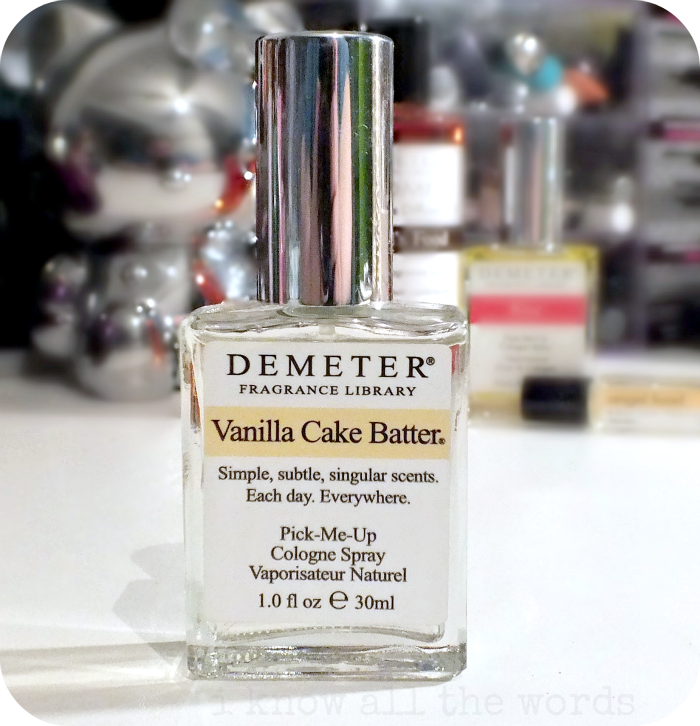 It really is a great scent, but it totally makes me want cake (or at least some chocolate) every time I smell it. 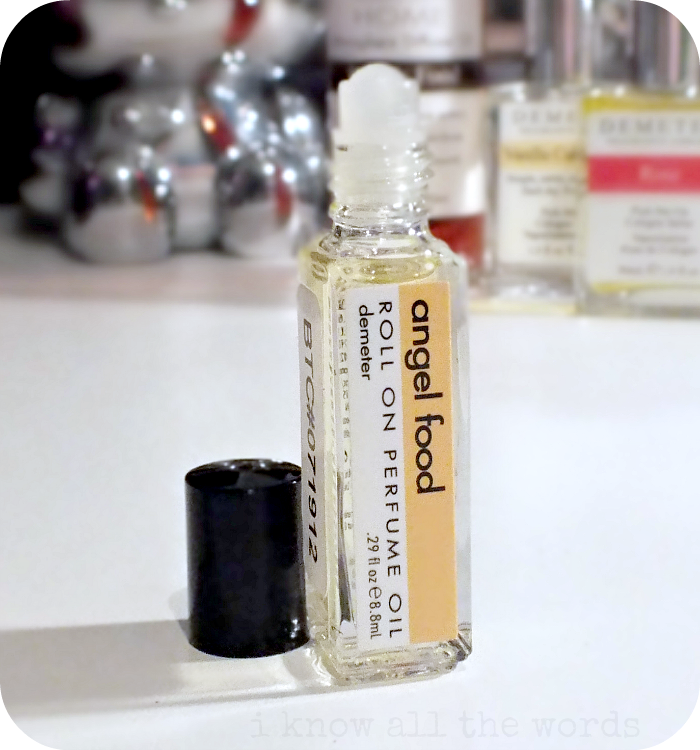 Demeter's Angel Food is the first scent that I tried from them. Knowing I already loved their cologne version, I was excited to see how the perfume oil would fare. I think I prefer the initial scent of the oil over the cologne as it seems more pure. You really get the understated sweetness of the sugar, vanilla and coconut, but I find that it doesn't last (at least not on me.) After an hour or so, the notes begin to fade to just vanilla. It still smells good, but a bit disappointing compared to what it smells like upon first applying. The upside is that since it's an roll on, it's totally portable and easy enough to slather on throughout the day. Overall, I'm a complete fan of Demeter. I've yet to experience any scent that I didn't love and with over 250 scents available (and constantly introducing new ones) there is sure to be something for everyone. 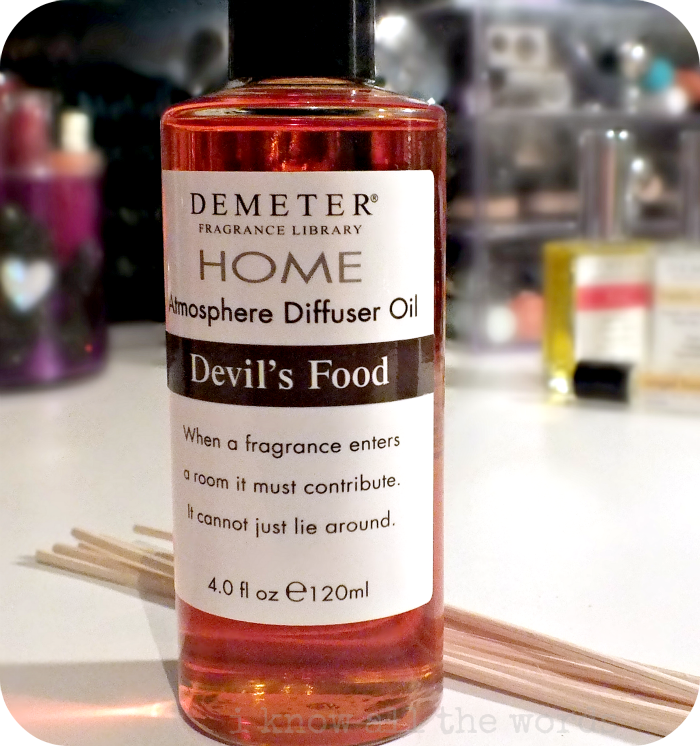 Do you have a favourite Demeter scent?